If you happen to be a science teacher looking for an intro to Newton’s laws, then I’ve got a story for you. Actually, I don’t have it – Radiolab does. We’ve all heard the news stories – “Cat Falls From 34th Floor, Walks Away.” And chances are you have wondered, “How do they survive such a long fall?” That is the question that Radiolab addressed in a podcast back in September of 2010. I won’t spoil it by giving you all the details (the podcast is hilarious and informative, so go check it out), but I will give you the gist. Cats freak out if they are accelerating (i.e., if their speed is changing). When they freak out, they tense up and get rigid, which is not a good way to land from a fall, because the body would not be able to absorb any of the impact. The key here is that it isn’t the speed that freaks cats out, but the change in speed. 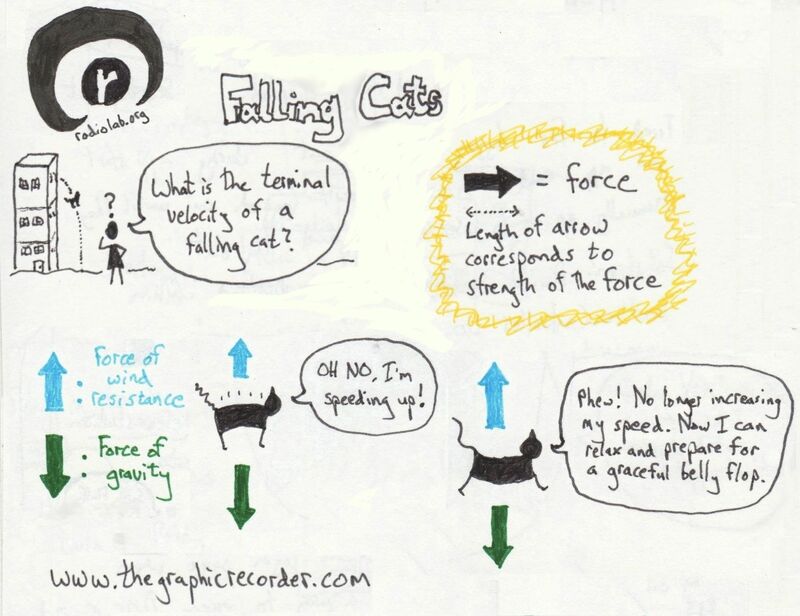 So if a cat falls from a spot that is sufficiently high, then it will eventually reach a speed great enough for the upward force of air resistance to balance the downward pull of gravity (that speed is called ‘terminal velocity’). When the forces balance, the cat stops accelerating, which means it can relax and spread out for the most effective belly flop I’ve ever heard of – a belly flop that reduces the blow on the body enough to save the cat’s life. Not bad, right?